In 1972, exactly one hundred years after the first national park was created, the nation made a similar commitment to preserving its marine treasures by establishing the National Marine Sanctuary Program through the authority of the National Marine Sanctuary Act of 1972, 16 U.S.C. § 1431 et seq. On January 30, 1975, the Monitor National Marine Sanctuary (MNMS) was designated our nation's first national marine sanctuary. Today, NOAA's Office of National Marine Sanctuaries (ONMS), serves as the trustee for a network of underwater parks encompassing more than 170,000 square miles of marine and Great Lakes waters from Washington State to the Florida Keys and from Lake Huron to American Samoa. The network includes a system of 13 national marine sanctuaries and two monuments, Papahānaumokuākea Marine National Monument and Rose Atoll Marine National Monument. Overall, the mission of NOAA's Office of National Marine Sanctuaries (ONMS) is to serve as the trustee for the nation's system of marine protected areas, to conserve, protect, and enhance their biodiversity, ecological integrity and cultural legacy. ONMS also fosters public awareness of marine resources and maritime heritage through scientific research, monitoring, exploration, education and outreach. To accomplish their mission, ONMS works with many partners and the public, while encouraging recreational and commercial activities that are sustainable and compatible with long-term preservation. 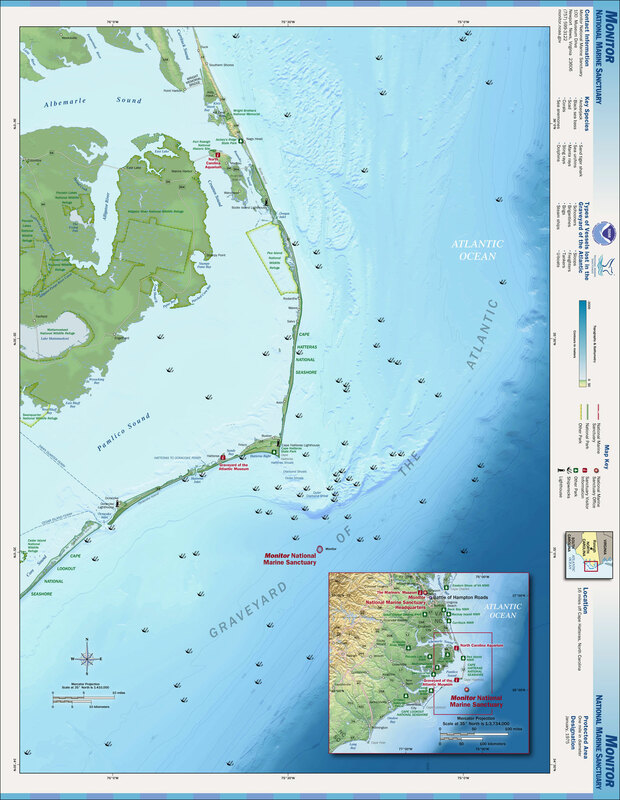 Situated just 16 miles off the coast of Cape Hatteras, N.C., Monitor National Marine Sanctuary protects the shipwreck of the famed Civil War ironclad, USS Monitor. The Monitor, while under tow to Beaufort, N.C., sank during a storm on December 31, 1862, and was not discovered until 1973. Today the sanctuary is managed by a staff of seven full-time employees through a combination of education, archaeology, marine science and regulatory programs. Staff members are located at offices in Newport News, Va. The year 2012 represents an iconic year for the USS Monitor. It marked the 150th anniversary of both her beginning and her end. 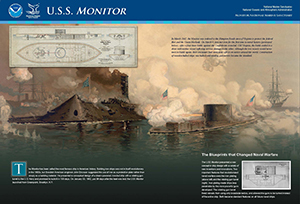 The Monitor's legacy began on January 30, 1862, as she was launched from Continental Ironworks in Greenpoint, Brooklyn, N.Y. March 9th celebrated the anniversary of the Battle of Hampton Roads, where the Monitor and CSS Virginia met in a battle that forever changed naval warfare. December 31, offered a look back at the loss of the Monitor's and 16 crewmen. Throughout the year, both NOAA's Monitor National Marine Sanctuary and our partner, The Mariners' Museum commemorated the Monitor's history with numerous outreach events. Visit the USS Monitor Preserving a Legacy website to learn more about this great ship and the commemorative events held in her honor. The State of the Sanctuary Report provides an overview of the current status of the Monitor National Marine Sanctuary and discusses the management activities and accomplishments since the sanctuary's designation in January 1975 through 2008. The Final Management Plan and Environmental Assessment for Monitor National Marine Sanctuary is a sanctuary-specific planning and management document used to identify immediate, mid-range and long-term challenges and opportunities, and to develop a dedicated course for the future. To obtain a copy of the Final Management Plan and Environmental Assessment email monitor@noaa.gov. 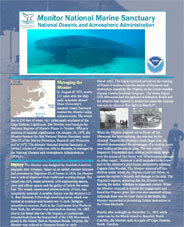 This fact sheet offers additional information about the USS Monitor and the sanctuary. This brochure highlights the Monitor's history, current research, conservation efforts, and more.